The use of a poorly documented WordPress constant. In this tutorial I’ll be moving all my sites assets from www.flynsarmy.com to static.flynsarmy.com. We’ll be making use of something called origin pull on CloudFront. 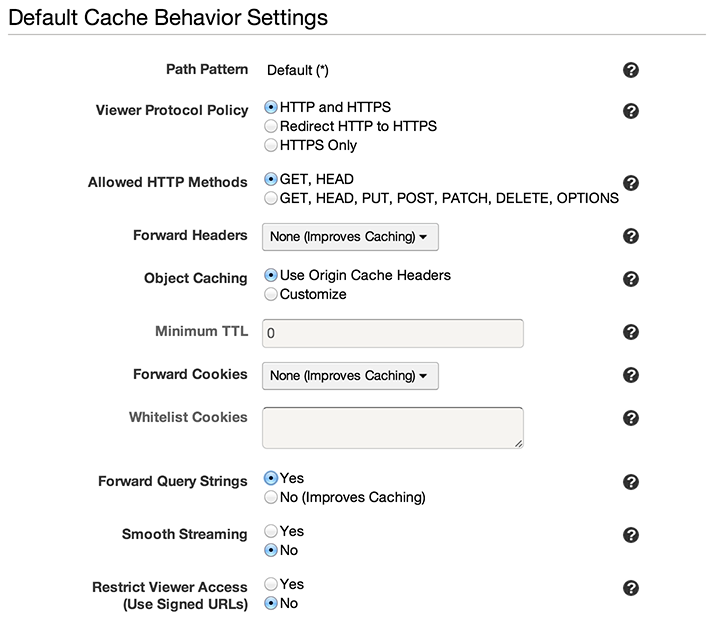 This is where when you hit a CloudFront URL, CloudFront will check to see if a cached copy of an asset exists and if not it will download the asset off your site. The cached asset lasts for 24 hours before its flushed and a new asset is downloaded from your server. Origin Pull is an extremely handy feature that takes almost all asset load off your server without requiring any major changes to your server or site configuration. These can all be left default, though I like to forward query strings so that if I need a new version of an asset served to all site visitors instantly I can just change foo.jpg to foo.jpg?v=2 for example. When done click Create Distribution. Take note of the Domain Name field. You’ll need this value in the next step. With the CloudFront distro created, we now need to set up the static.flynsarmy.com subdomain to point to it. This is done a little differently with every provider but is very simple. In keeping with the AWS theme I’ll demonstrate doing so in Route 53. 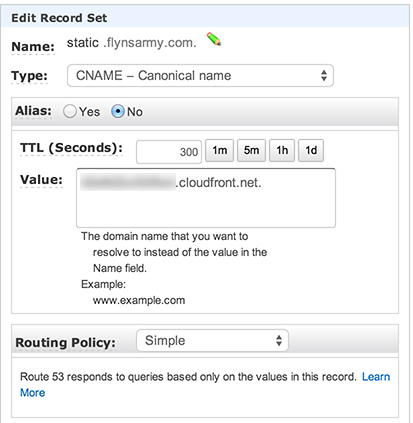 In the Route 53 AWS Management Console page, click Hosted Zones and double click the flynsarmy.com domain. Value: Enter the *.cloudfront.net domain from the Domain Name field in the Cloudfront Distribution you created earlier. static.flynsarmy.com. 300	IN	CNAME	www.flynsarmy.com. Try to load an asset file that exists on your main domain, replacing www with static at the start. It should now work! We’re on to the final step now. We have a working origin pull CloudFront distribution on a static subdomain, we just need WordPress to automatically point to that subdomain for all its assets. This is done with the WP_CONTENT_URL constant. I couldn’t find any official documentation on this constant, however drop the following into your wp-config.php just above the /* That’s all, stop editing! Happy blogging. */ line. Refresh your sites frontend. You’ll notice a bunch of your URLs are now using this subdomain. Also if you upload new files using the Add Media link in admin, they will also use the subdomain! One thing to note though is that all existing uploads will remain as they were. This change only affects newly uploaded assets and a few WordPress URL constants which are derived from WP_CONTENT_URL. By this point everything should be working great except web fonts which will throw an Access Control error and not render. This is due to Cross Origin Resource Sharing. To fix this drop the following into your .htaccess. You’ll need mod_headers enabled.